With Miraplacid Publisher software you can convert (print) any document to an image or web presentation ! With Miraplacid Publisher software you can convert (print) any document to an image or web presentation. Anyone can open your document across a broad range of hardware and software, and it will look exactly as you intended - with layout, links, fonts, and images intact. No one can modify or copy and paste your texts. 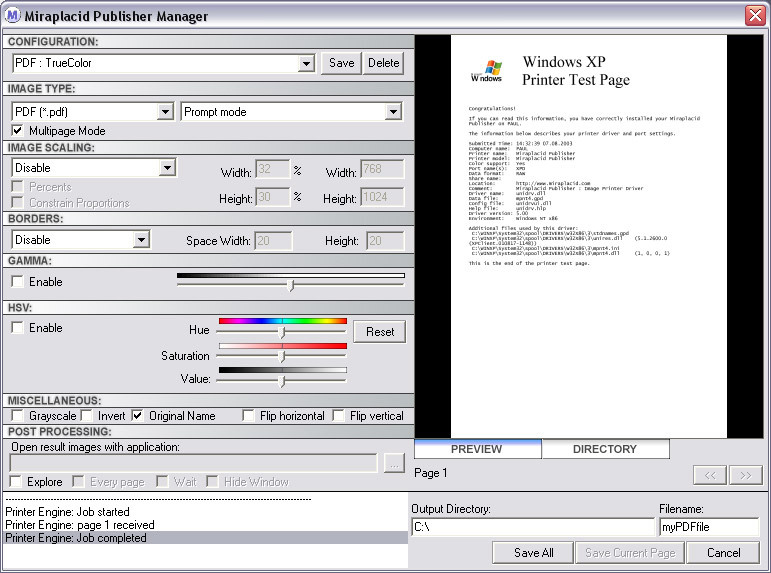 After installation on your PC, Miraplacid Publisher appears as a new virtual printer in your system. All the documents you print to this "printer" will be opened in a preview dialog. You can adjust hue, saturation and value, crop unused white borders, scale the images and do some other image processing. Then you have a choice - to save the results as images or web presentation or to print them to a real printer. Miraplacid Publisher supports following output formats: JPEG, PDF, TIFF, BMP, PNG, TGA and Web Presentation. Scale the image as you need, set output format and compression ratio, turn on borders autodetector to get rid of white unused borders. When redirecting to a printer, reduce saturation to save color cartridge or increase value to save black ink. Use borders detector in manual mode to set printing area when you need to print only a part of the page. Miraplacid Publisher is easy to install and easy to use. Miraplacid Publisher is integration-ready software. All the settings can be easily managed from your software or script. 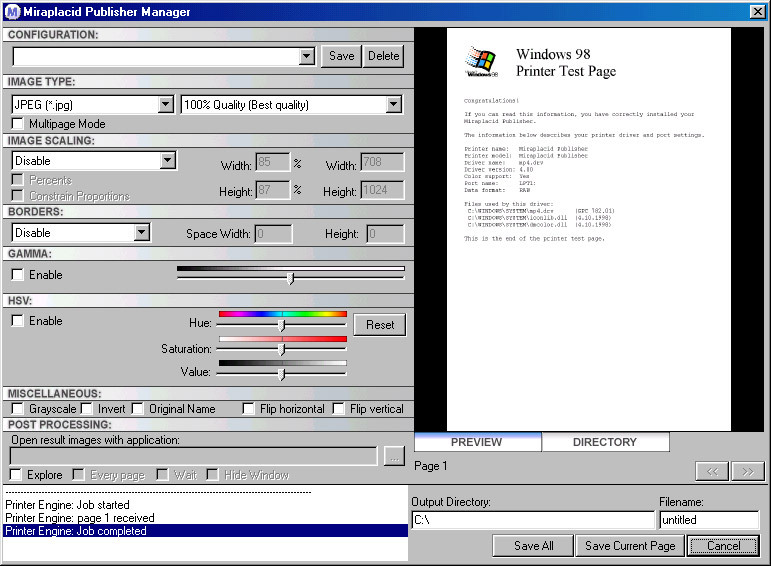 Miraplacid Publisher based on a new industry's first technology allowed us to merge image printer drivers for Windows 98/ME and Windows 2000/XP into one product. PDF format support. Now you can convert your document to PDF file. Flip the image. Miraplacid Publisher 4.2 supports Flip Vertical and Flip Horizontal. Apply both flips to rotate the image 180'. Drag and Drop document icon to Miraplacid Publisher icon. Advanced Office Password Recovery - decrypt password-protected Word and Excel 97/2000/XP files, guaranteed!